NASA/CXC/University of Colorado/J. Comerford et al. US astronomers have used NASA's Chandra X-ray Observatory and Hubble Space Telescope to spot a supermassive black hole located about 800 million light-years away from Earth. Speaking at an American Astronomical Society meeting in Washington, Julie Comerford of the University of Colorado at Boulder's Department of Astrophysical and Space Science said that they had detected a monster black hole's "double burp" after studying a distant galaxy named J1354. "We are seeing this object feast, burp and nap, and then feast and burp once again, which theory had predicted," Comerford said. She described black holes as "voracious eaters," which she noted "don't have very good table manners." — Chandra Observatory (@chandraxray) 13 января 2018 г. "There are a lot of examples of black holes with single burps emanating out, but we discovered a galaxy with a supermassive black hole that has not one but two burps," Comerford pointed out. Astronomers managed to track these outbursts of hot cosmic gas from the black hole upon studying data obtained the help of NASA's Chandra X-ray Observatory and Hubble Space Telescope. 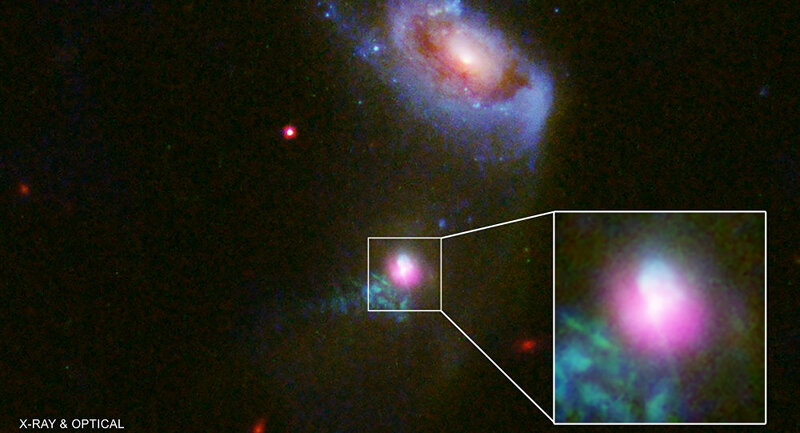 The "burps" occurred about 100,000 years apart, in the wake of the black hole's "two-course meal" from J1354' previous collision with another galaxy, according to NASA. It suggested that the supermassive black hole is millions or perhaps even billions of times bigger than our sun.